Pretty nondescript, and I always felt like the mantle was too high in comparison to the actual fireplace opening. There was something not right with the proportions. I have been doing my best to work with that extra gap by using swags and banners whenever I decorate the fireplace, but it is always A really noticeable large blank open space. Here is this year’s fall mantelscape for example. 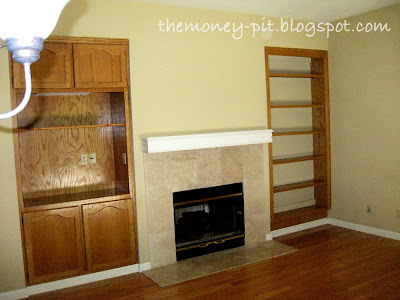 The other thing I didn’t like about it was the travertine blends in with the wall and the mantel. It is one monochromatic expanse. I knew that redoing the fireplace with traditional methods was going to be a really expensive, so I”ve been putting it off. But then I saw this product at Lowe’s and I had a lightning bolt moment. I could use FAUX stone to get the look of a stone fireplace, but without the expense or headache of installing an actual stone fireplace. So I contacted the people at Airstone and they sent me a few boxes to try. I would use Airstone again in a heartbeat. 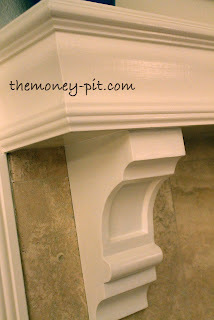 I was able to completely transform my entire fireplace in less than 5 hours. It looks and feels like real stone, only it is super lightweight (it reminds me of pumice stone) and cuts with a hand saw. No fancy tools required. The tile didn’t want to come off the backer board, so I ended up having to remove and replace it.. ALL OF IT. It was a huge mess. I received 2 boxes of natural edge stone (meaning the edges were finished to look like cut stone) and 1 box of flat edge (which are used side by side with each other for interiors seams only.) The boxes come sorted into the various colors (I was using the Autumn Mountain collection which is browns and tans) and so I needed to lay out all the stones in advance to get the correct mix of colors and to make sure that all my unfinished edges were made up of the natural edge stones. Remember when cutting, you need to hide the cut edge on an inside seam, you always want the natural finished edge to be exposed. It took a while, but eventually I went around all the edges and got everything dry fitted. I started at the bottom of one side and worked my way up, allowing the previous row to support the weight of the row above it. This part went really quick. I probably go all the tiles stuck up there in less than 2 hours. It looked great. I like how rustic it came out and I could have stopped there but based on previous experience I knew I wanted to add corbels. Now I just love the new look. Instead of a strange floating horizontal mantel, it now looks like it is supported, like a shelf. I do have plans to spray paint the brass like I did on the other side (although I hate it less with the stone.. it doesn’t’ bother me as much.) I am just so excited that I will have a new style/look of fireplace to decorate for Christmas this year instead of having two that are identical. 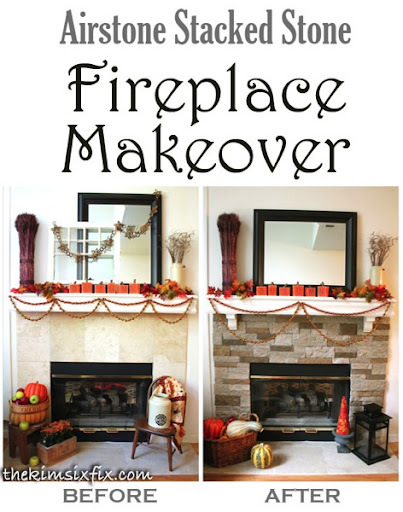 Now I just have to get through Thanksgiving, clean up all the fall stuff and move on to Christmas.. At least I can check the fireplace off my list!